The northern part of Vatnajökull National park and surrounding area is a magnificent landscape full of geological wonders. Around lake Mývatn, you will find hot springs, abundant birdlife, and a multitude of volcanic structures. Jökulsárgljúfur is a huge canyon formed by the glacial river Jökulsá á Fjöllum, Iceland’s second longest river. Húsavík is a charming fishing town, also known as the “whale-watching capital” of Iceland. Cycling around this region is a great experience. It is possible to complete the 212 km round trip in three days, but there is so much to explore that it is worth taking your time. Please note that services, campsites and shops are few and far between. Drinking water in this rather dry area can only be obtained at the few campsites and villages. Plan your trip accordingly and bring enough food and water. Leave Mývatn heading east along Route 1. After the short climb over Námaskarð pass, you will reach the Hverir hot spring area with steaming fumaroles and boiling mud pots. Continuing to the east, you will cycle into the vast expanse of Mývatnsöræfi. 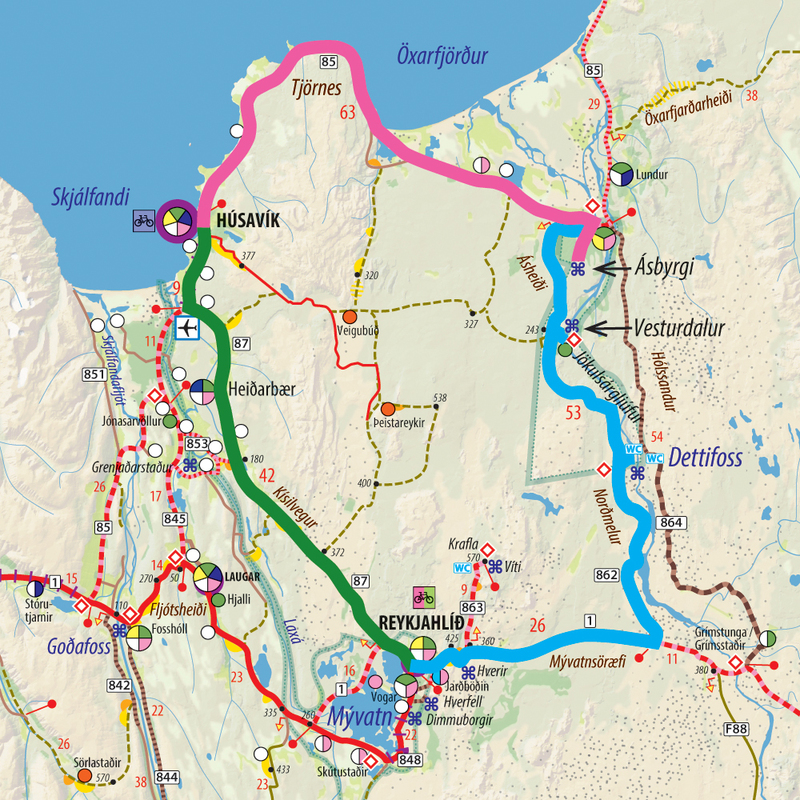 26 km after Reykjahlíð, turn left onto road 862, and cycle another 24 km to the parking site at Dettifoss (WC, but no water). A 20–30 min walk leads to Dettifoss, the most powerful waterfall in Europe. Every second, an average of 193 m3 of water drop 44 m vertically down into Jökulsárgljúfur canyon. To continue, you need to cycle 3 km back on the same road before turning north onto road 862, which for the next 20 km is a rough dirt road. Vesturdalur is reached on a short 2 km side road, which descends by 100 m of elevation, and has a 15% grade. But Vesturdalur is worth seeing: On a 20–60 min hike, you can explore Hljóðaklettar (“echo cliffs”), a distinctive cluster of columnar basalt rocks down at Jökulsá river, and in the valley you will find birch trees and a small campsite with WC and cold water. After you have cycled or pushed your bike back uphill, you will travel another 5 km on gravel and finally 9 km on asphalt to Ásbyrgi, an impressive horseshoe shaped canyon. Here you will find a great campsite, information center and small shop. Jökulsárgljúfur canyon is also great for hiking. You can leave your tent in Ásbyrgi or Vesturdalur, take a scheduled bus and hike back to the campsite. The entire canyon from Dettifoss to Ásbyrgi is a magnificent 2-day hike. In the morning, explore Ásbyrgi canyon. You can cycle to the end of the road and walk through the forest to Botnstjörn pond under sheer cliffs. Then start your journey to Húsavík along road no. 85, which will take you around Tjörnes peninsula. To the north, there are panoramic views of the Iceland Sea, and in June/July you will even see the midnight sun. Húsavík is a charming fishing town with a well-sheltered campsite. Directly across the road, you will find the public swimming pool/hot pots, which is a great place to relax after a long day of cycling. A walk to the harbour area is a must. There are many nice restaurants and cafés at the waterfront, but the biggest attraction is the abundant whales in the Skjálfandi bay. Leave Húsavík heading south on road no. 85, then turn left onto road no. 87 towards Mývatn. On the way, you can take a break at Heiðarbær, which has a restaurant, campsite and a nice swimming pool/hot tub. The road travels over a number of hills, and you will spend more time ascending than descending as Mývatn is 277 m above sea level. You will cycle through the Hólasandur sand area, where grass has been planted to stop soil erosion. From the last hill, you will have a great view over lake Mývatn before you finally reach Reykjahlíð. Here, you can stock up on provisions and choose between three campsites. Soaking in the warm waters between lava rocks at Jarðböðin (Mývatn Nature Baths) is the perfect end to this cycle route.